I've been working hard on a new entry, and have ditched 'Pew Pew' (I'll post a link on CT Forum for the source code for those that are interested). As the theme was Science Fiction / Fantasy I wanted to come up with something more out of the box. Bugs squashed thanks to user feedback: Erik no longer gets stuck on the door level, & warp sounds no longer trigger if times up. GOD MODE: On the Logo screen hold keys 'GOD' for infinite lives. 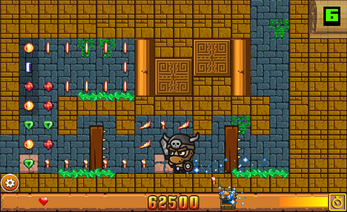 'Erik the Greedy' is a shake up of the basic runner style and dash genre. 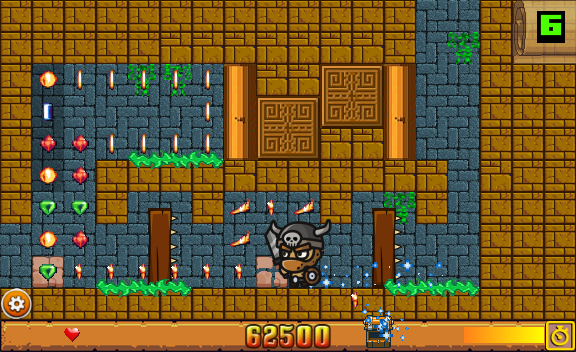 You play as Erik the Greedy. Driven by a greedy desire to pillage and plunder, you stumble upon Odin's Cave and the quest to retrieve the 'Emerald Eye' of Odin. The controls are super easy left, right and up arrow keys to dash (& spacebar or mouse for menu).